Our excursion of Sunday 5 April 2015 takes us to the seaside and a good part of the walk is along the coastline. The trail starts at the most amazing scenery of the Sea Caves (Thalassines Spilies) on the road from Agia Napa to Cape Greco and follows a rocky path by the sea to Cape Greco and the church of Agioi Anargyroi and back. The distance to cover is about 8 km, which will take about 3 hours. There is plenty of vegetation along the way, mainly low plants, including asphodels, sea squills, narcissus and mandrake (mandragoras). 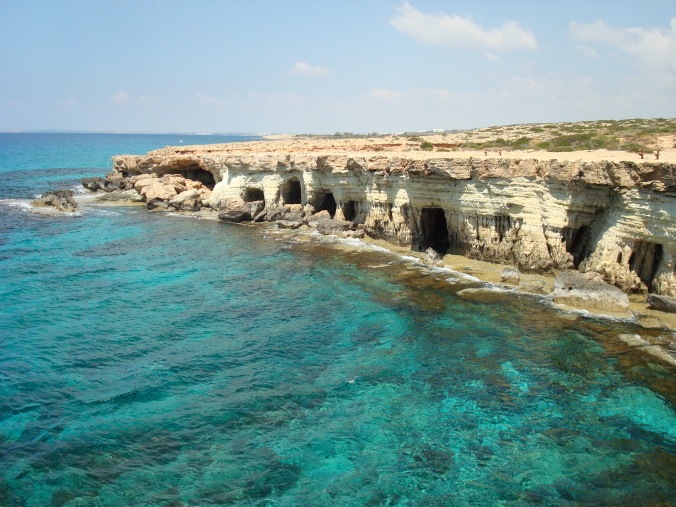 The Sea Caves – Cape Greco – Agioi Anargyroi walk starts at 11:30 am. Xenophon is leading this walk, which will go ahead even in light rain; if you need to, call 97613720. The walk is mostly on flat ground, with minor climbing sections and is classified as easy to medium difficulty (rating 1 to 2). Please wear a pair of proper hiking shoes, since walking on sea rock is not easy. At the conclusion of the walk we shall have plenty of time to admire the unique Sea Caves landscape and take photos. After the walk we shall drive, in a convoy, for a picnic at the Agioi Anargyroi designated picnic site. The site offers several tables and benches, under cover, and the necessary facilities. Given that the tables and benches have a roof, the picnic will go ahead even if there is light rain. However, you are encouraged to carry a wind jacket, since the site is very close to the coast, and likely to be windy and chilly. You have the choice of meeting the group at the walk start, if you are very familiar with the place, or meet at the designated meeting point in Nicosia. In either case, you need to carry copy of this set of instructions. Meeting in Nicosia offers two important advantages: we drive in full cars, leaving some cars behind; thus, we save in fuel and enjoy the trip in good company. The meeting point in Nicosia is the Handicrafts Centre (Kentro Heirotechnias) on Leoforos Athalassas (Athalassa Avenue), which offers ample parking space. The car trip starts at 10:00 am. Please ensure you observe start times, for the benefit of the group. Get to the main junction between Leoforos Lemesou/ Limassol Avenue and Leoforos Athalassas. Zero your odometer at this junction. Drive along the Nicosia-Limassol motorway, heading towards Larnaca. At the 34.6 km reading, you reach a major roundabout. Ignore the 3rd exit to the right, which leads to the airport. Ignore the 2nd exit, going straight, towards Larnaca city. Zero your odometer and turn left, towards Dhekelia and Agia Napa. Continue on this main motorway. At the 43.7 km reading you reach the end of the motorway, at a crossroads. Ignore the exit to the left, leading to Paralimni, Deryneia and Protaras. Take the exit to the right, towards Agia Napa and Cape Greco. The road goes downhill and reaches a roundabout at the 44.9 km reading. Ignore the exit to the left, to Kokkines. Ignore the exit to the right, to Agia Napa. Go straight, towards Cape Greco and Protaras. At the 50.5 km reading you reach a sign indicating a) ahead on the E306 road, to Protaras (5 km) and Paralimni (15 km) and b) a right turn on the E307 road, towards Cape Greco (3 km). Turn right. The road leads to the start of the Sea Caves trail. A mere four hundred metres further on, there is a discrete sign indicating a right turn to the Sea Caves, along a dirt road. Turn right and drive downhill for a few hundred metres to a parking area, overlooking the Sea Caves, which you see ahead. We meet here.